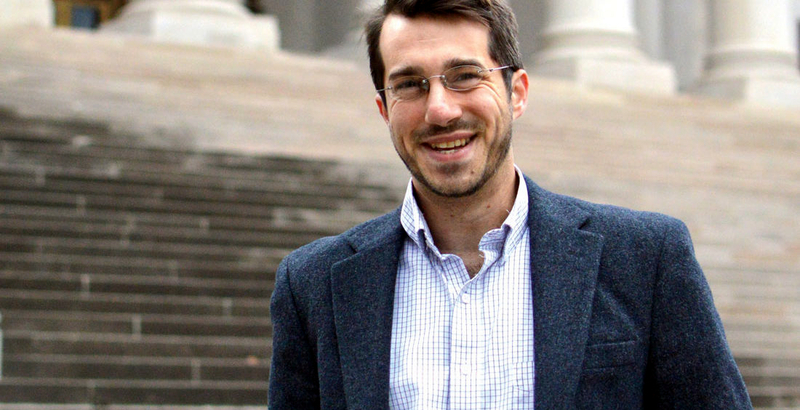 For those who remember W&L Law alumnus Sam Petsonk ’13L, they will not be surprised by the recent feature in WV Living detailing his work for the homeless population of Charleston. Petsonk, an attorney with the public interest law firm Mountain State Justice, came to the assistance of the residents of a large tent city along the Elk River after local officials ordered the police to break up the camp. He filed a class action suit against the mayor and police department alleging that the eviction and destruction of residents’ property had violated both the U.S. and state constitutions. The lawsuit largely remained out of the public eye because Petsonk went directly to city officials with the complaint, hoping that the city, legal aid attorneys and other homeless service providers could come together and collaborate to find a better solution. And that is exactly what happened. In addition to monetary restitution for the residents of the tent city, the agreement included the construction of storage lockers for the homeless population to use and 14 days written notice before taking action against an encampment. The city and its service providers are also required to provide permanent housing for residents of an encampment. Charleston is now one of only two U.S cities required to provide alternative housing prior to evicting an encampment. Petsonk earned praise for his efforts from Maria Foscarinis, executive director of the National Law Center on Homelessness and Poverty, a D.C.-based organization that supported him during the negotiations. “Sam’s work represents a model we hope other communities can learn from and implement,” she told WV Living. Petsonk was born and raised in the coal-mining area around Morgantown, West Virginia, and used the financial support from his Skadden Fellowship to go to work with Mountain State Justice representing low-income West Virginians, primarily in workers’ compensation cases.